When I went to college, I lived in the dorms for two years. One of those years, I had a roommate we all called "Philly. *" Even though we essentially had NOTHING in common, Philly and I got along quite well. He was an outdoorsy-hunter-type who was a redneck in every single way - except for the fact that he was a smart-as-hell engineering whiz. Seriously, I was in awe of how smart this kid was. Then there was me: A Sociology/Criminology major who did enough studying to get by, spent most of his free time with his girlfriend, and worked at Wal-Mart. Even though we were polar opposites in regards to our education and family background, we did share one common thread - we both had a fond affection for beer. The first weekend we were at school, we both went to the local grocery/liquor store and each picked up a case of Busch Light bottled beer. Back then, Busch Light bottle cases were made out of hard and sturdy cardboard boxes that had lids you could open and close. This was nice because we had a place to not only store the empty ones, but if your fridge was full it was a safe place to keep the full ones. What was also nice was that I found out the boxes doubled as a nice little table. I could be found many nights sitting Indian-style on the floor in front of beer case and doing my homework in front of the TV. Others thought it was hilarious looking but I found it quite comfortable. It was better than the crap chairs we had for our desks there in the room. As time progressed over the coming weeks/months, our "collection" of Busch Light cases grew and grew until we had a full-blown coffee table of beer cases. We set the TV remotes on it, had a variety of magazines fanned out in a display, and of course we set our beers on it with no worries about water rings. It was truly a beautiful thing. Word of our "coffee table" spread through-out the dorm, and we had many people stop by on a regular basis to have a look at it. We'd even notice from time to time that some of the people walking by were residents of other floors in the building, and if our door was open they would slow down as they walked past to have a gander. Apparently having 10 cases of bottles in the middle of your room is something to see. 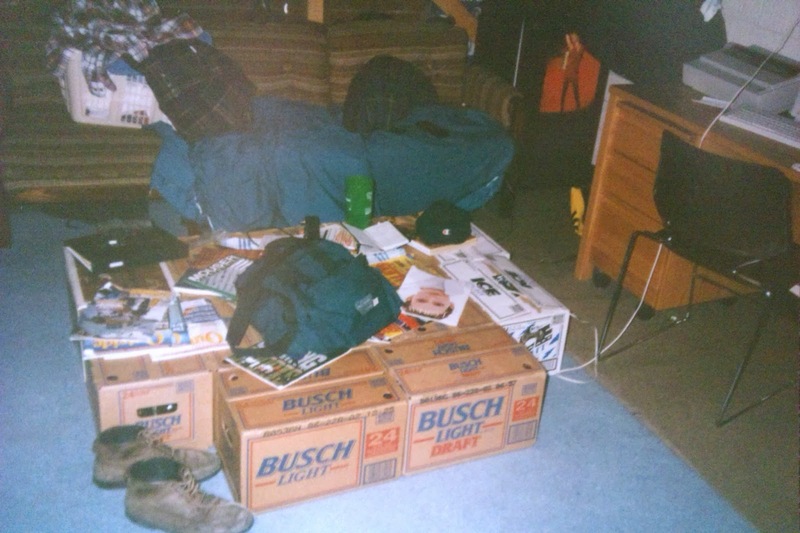 Eventually the table became comprised of several different brands of bottled beer, and a few people even "contributed" to it. I remember one particular case that was given to us was some NASTY "bock" style beer that still had full bottles in it. I still remember dumping those out at year end and the smell was horrific. The real prize at the end of the year though was going to the store to cash-in the deposit on the bottles. Needless to say we spent it on another case of beer. Have you missed a previous episode of Monday Morning Stories With Mookie? You should click HERE to see the entire catalog!